If you're looking for a place to cool off in New Jersey, there is no shortage of water parks to choose from. Some feature adrenaline-pumping thrill rides, while others are better suited for the youngest of visitors. 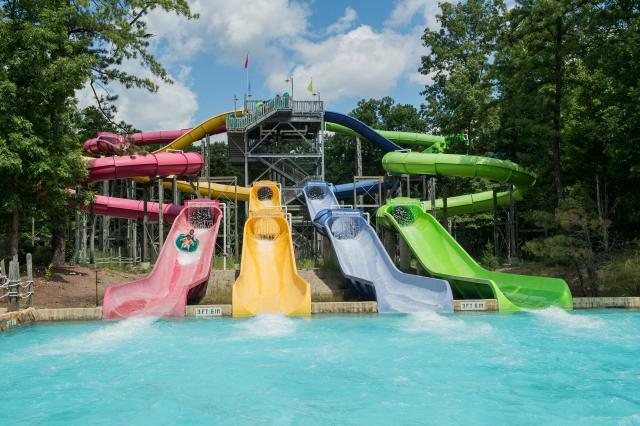 There are at least 15 different water parks in the state; listed here are a few of New Jersey's best. The Runaway Rapids Waterpark is located at the Keansburg Amusement Park in Keansburg. If nothing else, this water park gets a nod for its historical value. The family broke ground on the park in 1904 with plans for a summer resort. Hurricane Sandy wiped out some of the park and surrounding areas in 2012, but they were back up and running the following year. This park is good for adults and little kids alike. You'll find a lazy river, toddler's play area, two spa pools, and 18 different thrill water slides and attractions. Some adult-oriented attractions include Mega Bunga Falls, where you'll head down a short and steep slide before being dropped into the splashdown pool. Soaring Thunder has side-by-side slides that send riders headfirst down a steep, twisting and curved slide. Young kids will enjoy the calm Yellow Slides, Frog Slide, and Toddler's Reef. A bonus here is access to go-karts, batting cages, and other fun games at Keansburg Amusement Park, as well as the Jersey Boardwalk. 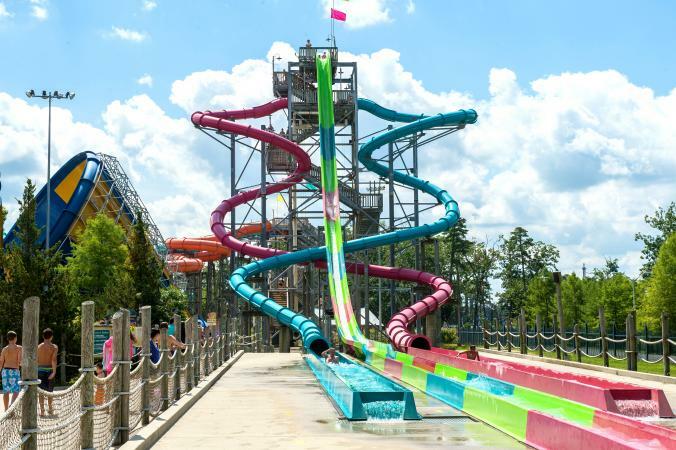 Runaway Rapids' operating season runs from the end of May through early September, and the park was ranked by Crazy Tourist as one of the 10 best water parks in New Jersey. Rides and go-karts are priced individually, while water park ticket prices range. Passes are good for two to three hours of enjoyment for $25 to $30. If you want to save some money, consider coming in for Splash Night pricing after 4 p.m. on Saturdays, Sundays and Mondays. Time Out rates Wildwood's Morey's Piers: Raging Waters and Ocean Oasis Water Park as their top pick among the best water parks in New Jersey for families. Here, you'll be treated to a day at two different water parks with lots of adventure-filled activities. Located behind Surfside Pier, Ocean Oasis Water Park & Beach Club features private cabanas and a selection of wild water slides, such as the Cliff Dive slide that drops you down five stories in only three seconds. The newest ride is WipeOut!, a six-lane slide where you race down the 350-foot-long slide starting at 40 feet in the air. This park is great for families, but it's also ideal for couples looking for a day out. Hang out at the Water Lilies Swim Up Bar where there are no kids allowed. However, if you're on the hunt for what the young ones can do, Bonsai Beach is a family-friendly area with water jets, climbing ropes, and slides. Raging Waters has two distinct kids' play areas where you'll find water cannons, Camp KidTastrophe, and a three-level activity area with cargo nets, climbing ropes, water sprays and guns, and slides. Big kids will want to check out the thrill rides like Shotgun Falls where two flume body slides drop riders six feet into a 10-foot pool, or the unique Sky Pond Journey where riders slide along in tubes through four different elevated pools as they head towards the final splash. These water parks are open from the end of May through the beginning of September. Tickets usually go on sale in March. Admission prices are just under $50 for adults, with discounts available for children and seniors. Combination tickets for the amusement rides and both water parks are also available, priced around $80 for adults and $60 for children. Head away from the boardwalks and the beachside resorts and head to Mount Laurel for CoCo Key Water Resort, an indoor, 55,000-square-foot water park at the Hotel ML. CoCo Key offers attractions for both young kids and adults alike. Fun New Jersey recommends CoCo Key Water Resort as an indoor water park that is open year round. Kids of all ages will enjoy Parrot's Perch, an aquatic jungle gym with water cannons, three slides, and an interactive play area. For the little ones, Dip-In is a wading pool that is only a foot deep and offers baby slides. If you're looking for something less tame, Shark Slam is a 4-story, 300-foot-long slide that sends you down a series of curves and turns, or the Barracuda Blast, that sends riders down in the dark through loops and turns before landing in the slide pool. If you purchase passes online, you'll save some a few dollars. Day passes are typically around $25; children under 2 and adults over 65 are free. Other options like twilight passes offer discounts if you only plan to go for a few hours at night. Military and first responders get a discount with proper ID at time of check-in. Six Flags is known for their theme parks and the chain of Hurricane Harbor water parks. The Best of New Jersey includes Six Flags Hurricane Harbor, located with Six Flags Great Adventure in Jackson, in their round-up of the best water parks in New Jersey state. Big kids and adults will want to check out Six Flags' attractions like Bada Bing, Bada Bang, Bada Boom!, which is a three-slide complex offering smooth slides, fast slides, swerving slides, or all three. Cannonball, Wahini, and Jurahnimo Falls is a combination of heart-pumping slides, complete with a 75-foot drop. There is a lazy river guests can relax on in between rides too. Young ones will want to hit the Blue Lagoon wave pool or the Caribbean Cove play area. The season usually starts around the middle of May. Six Flags offers a variety of daily tickets and season passes. General admission tickets at the park generally range from about $35 to $50, while children 2 and under are free. There are also season tickets and membership options that include discounts and additional benefits. With so many water parks in New Jersey, it's hard to narrow down your options of which one to visit. With most being geared towards both families and adults alike, it may come down to location and prices. If you're visiting New Jersey in the winter, you'll need to look for indoor water parks that are open year round; otherwise, boardwalk and beach-based water parks are awesome choices during the warm Jersey summer months.